Report, though, sheds some light on the issue. It appears that Congress was, in large measure, concerned with external impacts (particularly oil spills) that might result from a security incident. Convention). Such a delay in the estab- lishment of specific training require- ments will provide training institutions time needed to develop curricula and companies time needed to send their personnel to the schools. It is important for the Coast Guard to signal its inten- tions early, in order for the regulated community to provide meaningful input and plan ahead. In similar fashion, the original OPA 90 regulations were inten- tionally vague regarding several issues that were fleshed out in the next iteration thereof, after vital experience was gained and public input was considered. Incident Response Plans, which are dis- cussed above. It is recommended that the Coast Guard work diligently toward meeting the April 1 deadline, but accept the fact that not all deadlines can be met. Pollution Act of 1990 (OPA 90) was met by the Coast Guard officer assigned to that project (myself). Deadlines such as this are excellent incentives, but not always within the realm of possibility. Port Security Barrier establishing a perimeter to control onlooking vessels during the transfer of Howard Hughes famous "Spruce Goose". 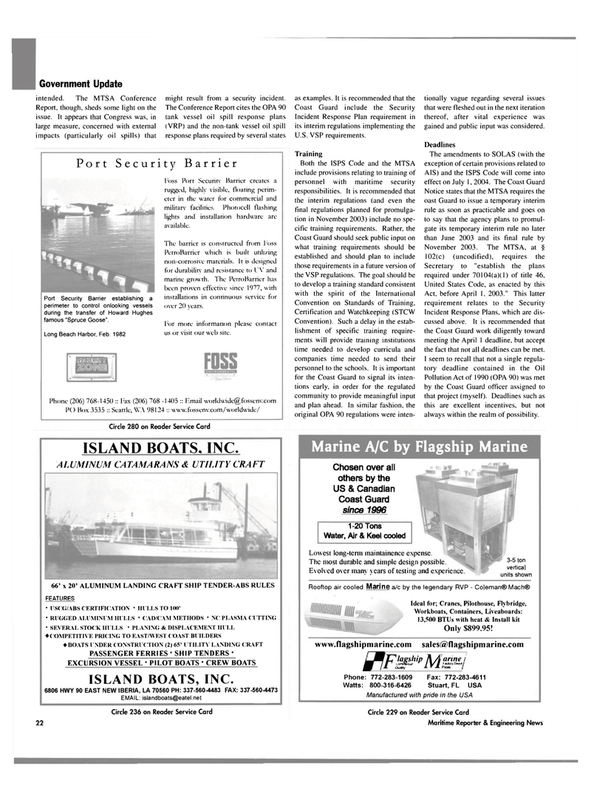 Foss Port Security Barrier creates a rugged, highly visible, floating perim- eter in the water for commercial and military facilities. Photocell flashing lights and installation hardware are- available. PetroBarrier which is built utilizing non-corrosive materials. It is designed for durability and resistance to I V and marine growth. The PetroBarrier has been proven effective since 1977, with installations in continuous service for < >ver 20 years. For more information please contact us or visit our web site. The most durable and simple design possible.